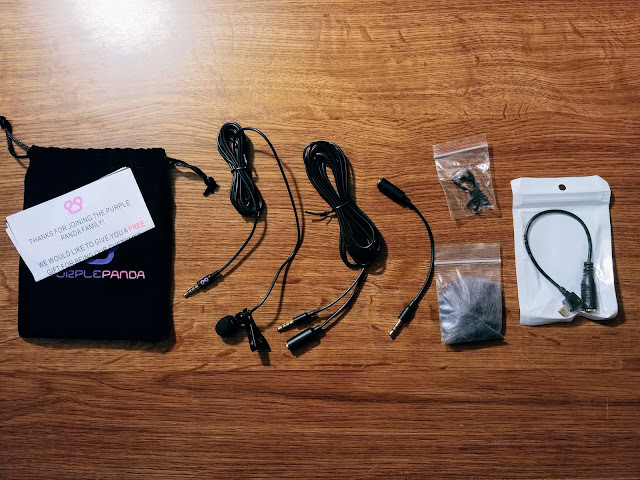 I heard about this inexpensive lavalier mic and decided to give it a try as I occasionally do on-location recordings and interviews for some of the podcasts on my network and I am always interested in ways to get good clean audio. The Purple Panda Lav Mic Kit looked like an affordable option for this purpose. It came to about $24 with shipping for the kit. 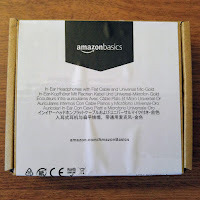 The product arrived inside a simple bubblewrap lined manila envelope. I would have liked to see it in a box to protect it, but so far my unit seems to have survived the postal service without damage. Contents: The velvet pouch, lav mic with a decent length of cord (didn't measure, but guessing at least 3 ft.), additional extension cable (about 10 ft.), TRS adapter for digital recorders, adapter for DSLR cameras, an extra mic clip, and a mini dead cat windscreen in addition to the foam one that comes installed on the mic, instructions for which cables to use for different devices. I recorded a couple of quick tests with my smartphone and with my Roland R-05 digital audio recorder. 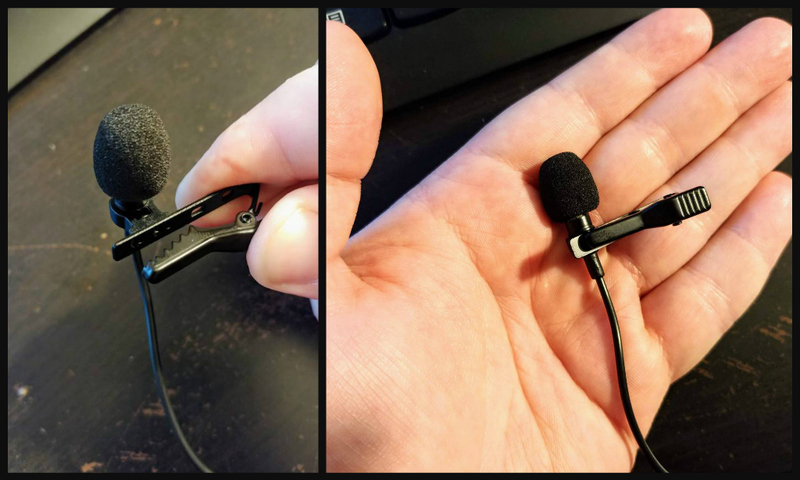 The following are two tests recorded in a room in my house that is not sound treated and is quite reverberant and since this mic is a condenser it picks up lots of room tone. There is no processing on this audio at all. Then I went into a smaller room and recorded a test there; also unprocessed. Next, I took the mic outside to record see how it handled recording my voice while there was outdoor ambiance in the background. This audio was recorded with my LG smartphone. And finally, in case you wished to hear the first three tests after I did some noise reduction and ran some EQ and compression, here you go. All things considered, I think this mic is a good value and it seems to be of solid build quality. The audio I got from it seemed very good considering the environments which I was recording in. It is definitely worth checking out. Well, there you are. 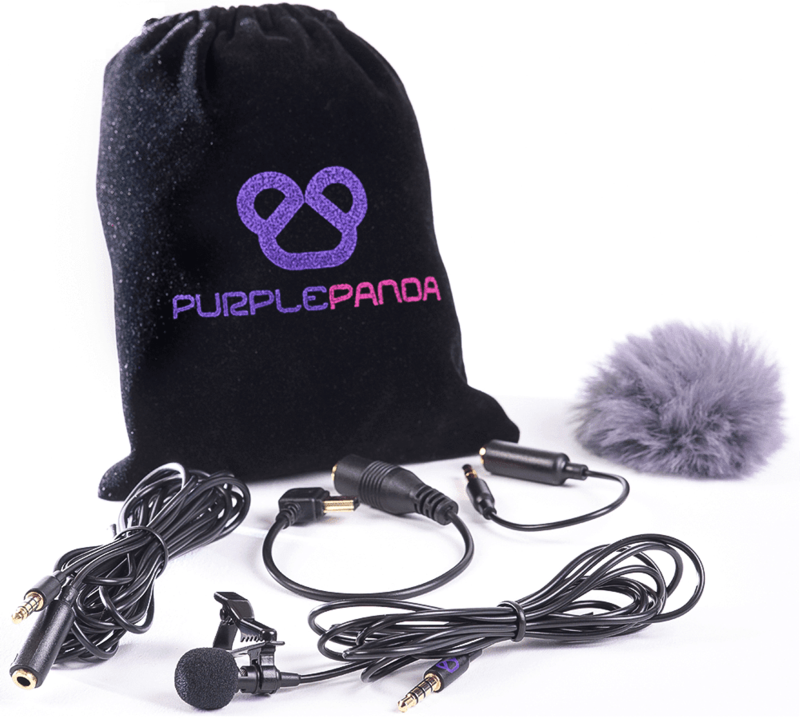 My first impressions and a couple quick audio tests of the Purple Panda Lav Mic Kit. If you have any questions, let me know in the comments. You can grab this kit on Amazon through my affiliate link if you wish. If not, you can purchase directly from Purple Panda at this link. What I do at the beginning of the theme music process is really give a lot of thought to the feel of the podcast. What style of music would be most appropriate for that specific topic? What sort of music will help to set the stage for the content? What style will be more appealing to my target audience? If it's a show about knitting then I don't want a heavy metal intro tune. Then I think about instruments. Do I want it to be piano-driven or guitar-based? Or am I looking for something more orchestral? I also take into account the tone of the host's delivery or if there's a cohost then consider the conversation style of the hosts and how they interact. If a solo show, you don't want a crazy rockin' intro if the host is super laid back and chill in their presentation style. It's too jolting for the listener's ear to have such a contrast. If multiple hosts, the same thing goes; if they have great banter and there is a humorous side to their conversation then you probably don't want a slow, classical-sounding orchestral piece. The goal is to complement the host's presentation style with the music. Once you've answered these types of questions then it's just a matter of explaining your vision to the composer. All of the composers I've worked with have been able to come up with a great tune that fit the needs of the show. Now it may not happen on the first try. I've had to ask for them to take another stab at it on occasion, but a good composer will give you a rough "draft" of the piece for approval before they fully flesh out the instrumentation. Also keep in mind that the composer knows music (if you're using a pro, of course) so be open to how they may interpret your commission. Even if on first listen it may not match with what you heard in your head. They may just have come up with something that you might not have ever thought of. So where can you find a good composer? Well first, I’d start with any personal connections or references you might have. Or find a composer on SoundCloud whose work you like and reach out to them. You can also try Fiverr or such places, but I don't really recommend those platforms for this type of gig. You just never know what you’re going to get that way. Here are a few of the composers that I've either worked with personally or have clients or colleagues who've used them. Also, keep in mind that if you have a musician friend you could always just see if they would be up for putting something together for you. One podcaster I know had a friend who played guitar come over to his studio and he just recorded him doing little riffs and strumming around for a few minutes then he took those and cut them into an intro and segment stingers and it sounds great. Now that may not be the best solution for every show, but it's an option to consider. Regarding the cost, there's quite a range. It can depend on the complexity of the composition, the length of it, etc. 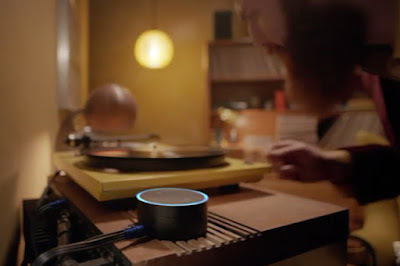 It is a bit of an investment, but one that I think is worth it to have your show stand out and have its own unique sound. I am not opposed to using stock themes or loops for a show, but most times I believe a custom theme is the better option. Now I realize that some of the above questions are difficult to answer if one has yet to record an episode of their show so I often recommend to clients to record a few test pieces of audio to get a feel for the show's dynamics before commissioning a theme. These recordings may or may not actually be used in a publically released episode, but it will give an idea of what the show could sound like. At the very least, record a few runs at delivering the show opening that will be used with the theme to see how they would sound when mixed together. Hopefully this has been helpful. I’d be happy to answer any other questions you might have regarding this topic. 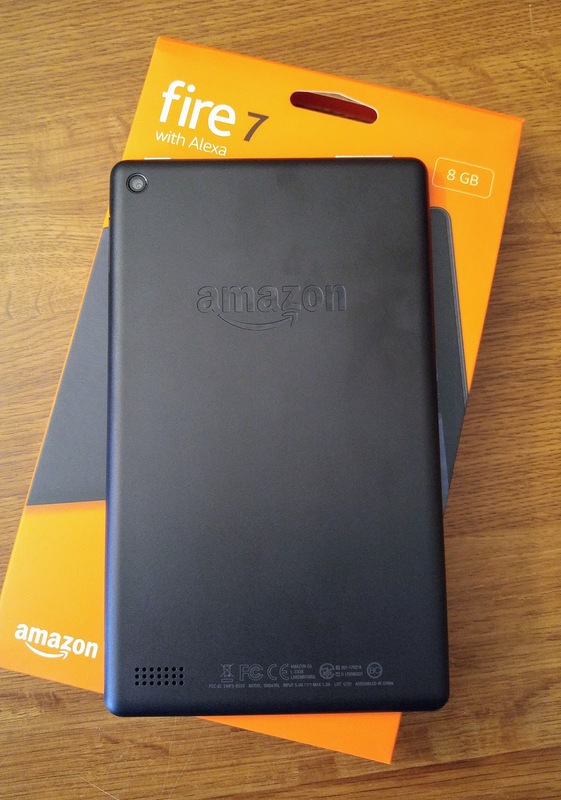 I decided to take advantage of some Prime Day discounts and pick up the 2017 edition of the Fire 7, Amazon's budget-friendly 7-inch tablet. This is the 8GB model with the Amazon "Special Offers" deals on the lock screen. 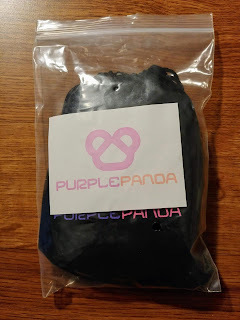 This post is not a comprehensive review, but I wanted to share my first impressions with the device after putting it through a few paces over the past couple days. 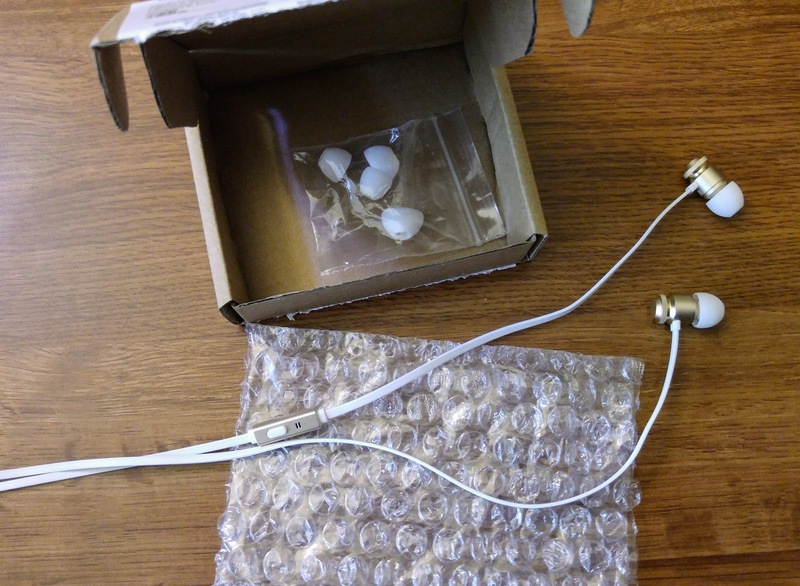 Inside the package, you'll find the tablet, a/c charger, USB-3 charging cable, and documentation. No special accessories included, which you won't really expect for such a low price. 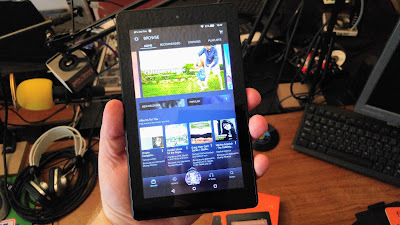 The tablet is quite chunky; certainly not a sleek, slim device like the Nexus 7 or similarly sized devices. It has both front- and rear-facing cameras, a speaker on the bottom left-hand corner of the rear side. There is a micro-SD card slot on the right-side and a volume rocker and power/screen-on button on the top. 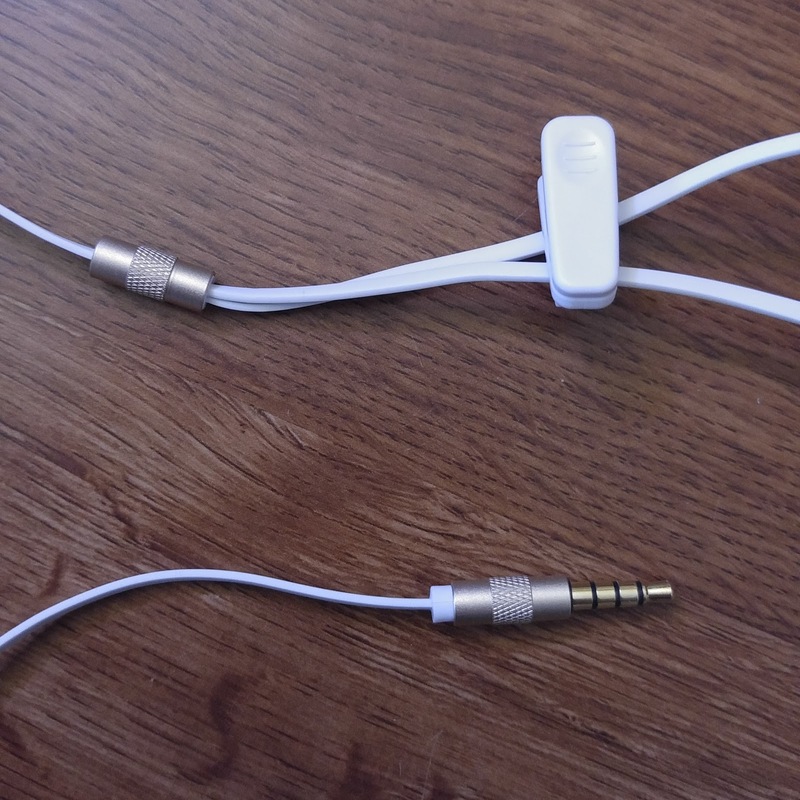 Also on top is the headphone jack and charging port. 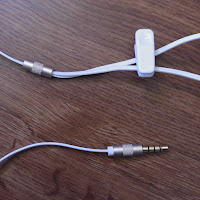 The cable is about 3 feet long so you may need an extension cord if you wish to use the tablet while it's charging. It does fit into the port quite securely unlike some of the other cheap Android devices that I've checked out before. The tablet is running a customized version of Android, which Amazon calls Fire OS. It does not have access to the Google Play Store so you have to use apps that are available in the Amazon Appstore. This means that none of your typical Google apps, which are often pre-installed on most other Android tablets and phones, are even available for the Fire tablets. The Fire has an internet browser called Silk which seemed adequate, but I missed having all of my Chrome bookmarks. The Kindle, Audible, Music and Amazon apps worked quite well as you might expect. The speaker on the back has pretty decent volume though you may still want an external speaker or earbuds. 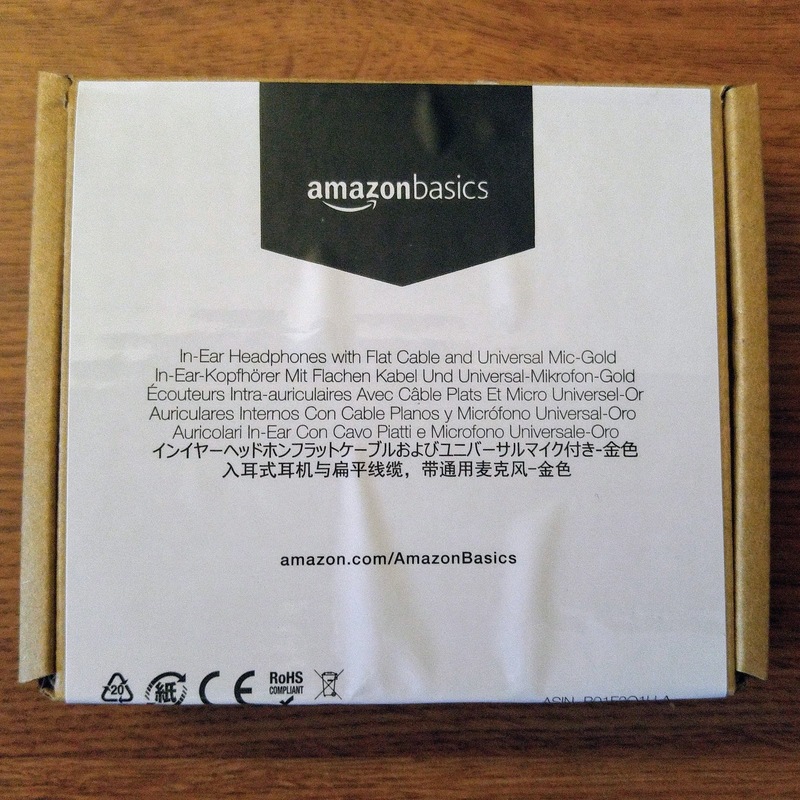 I picked up an inexpensive set of AmazonBasics branded earbuds to use with the tablet and have been quite pleased with them. As I mentioned above, I opted for the model which includes ads for specific products on the lock screen. The benefit of this is that the device has a significantly lower price tag than its counterpart without the "Special Offers". I didn't find them to be too bothersome. As soon as you swipe to unlock the screen they go away and you are able to use the device without any restrictions. This 7th Generation edition of the tablet also comes with the Alexa Voice Services installed. I found this to be a nice feature, but one I didn't use all that much. 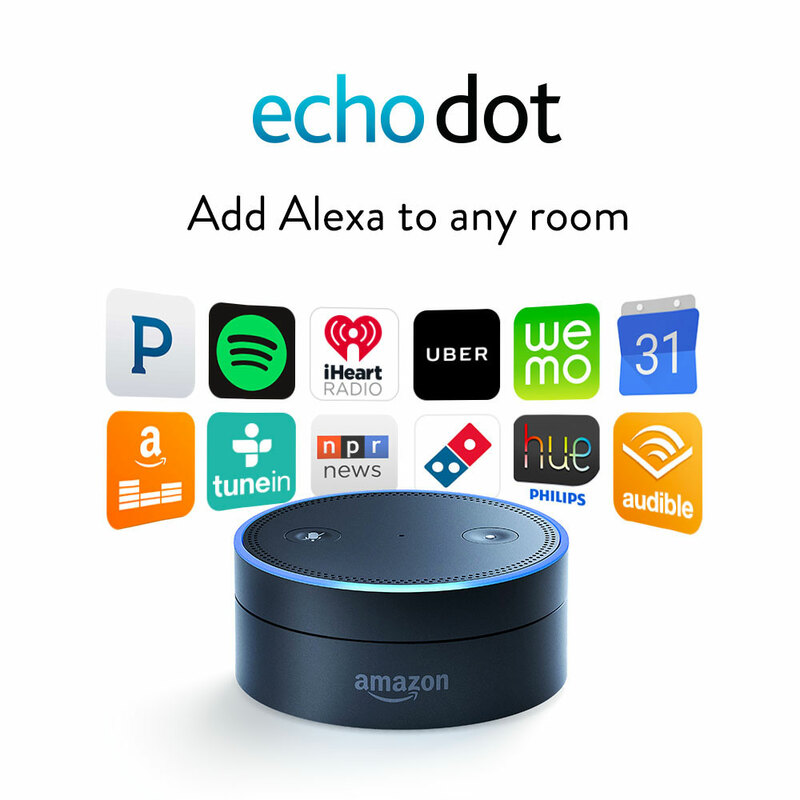 I have both the original Echo and an Echo Dot in my home and I use them all the time. I just didn't find a need for Alexa on the tablet, but perhaps with more use of the device that will change. My favorite use case for the Fire 7 was to read Kindle books. And I did download and try out a couple of free games from the Appstore that were quite enjoyable. This device is not a powerhouse, nor is it intended to be. If you're looking for a productivity tablet then you may want to pass on the Fire 7. But if you want a media consumption device or ebook reader which can also run a few apps and games and has web access, then I don't think you can go wrong for the price. Check out the Fire 7 Here. 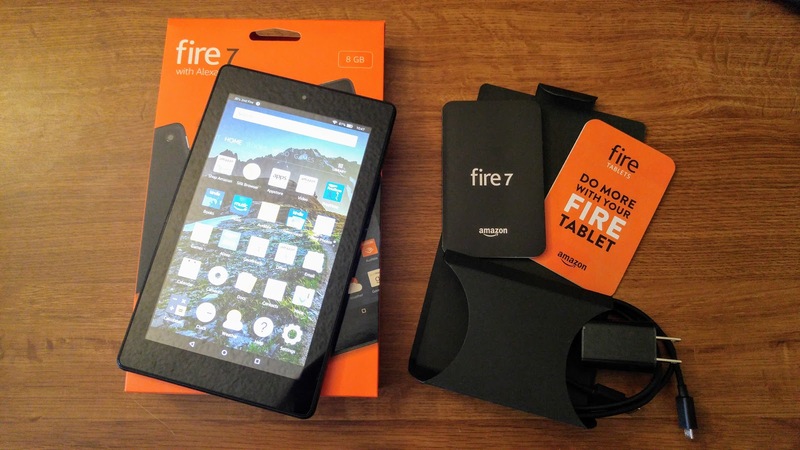 You may also want to consider this Fire 7 bundle which includes the tablet, screen protector, and case for a $15 savings. This episode began as a blog post so instead of a transcript, here is a link to the post which contains all the applicable info and links. 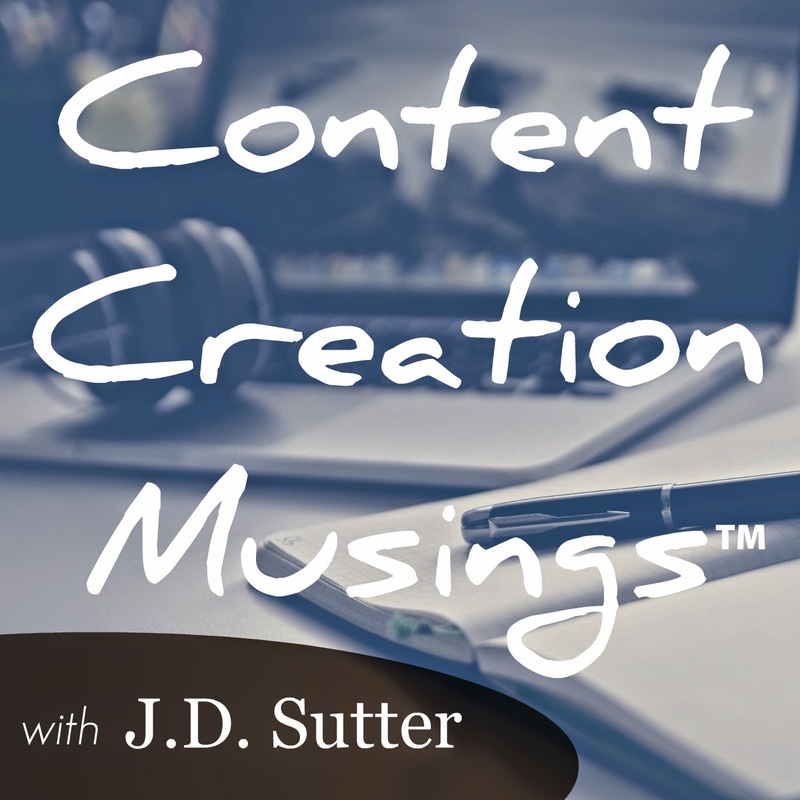 Send your feedback to show@jdsutter.me or post in the comments below. Have you ever wanted to visit Israel? 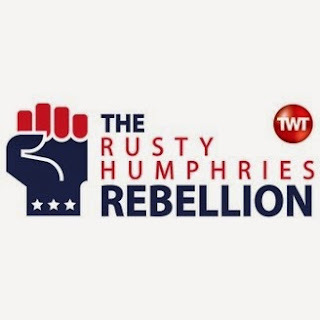 How about a fully immersive audio tour of courtesy of podcast, The Rusty Humphries Rebellion? 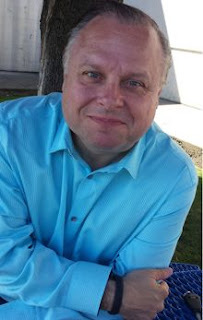 Rusty visited many sites throughout the Jerusalem and the surrounding areas in 2015 and captured his experiences in a mini series on his podcast. As he toured the country he recorded many of his stops in binaural audio (also known as 3D audio) which gives you an amazing audio experience when listened to with headphones. This series is downright stunning to listen to. And even if you're not into politics, I recommend checking out this series of episodes only for the sonic experience. I'm not sure if this type of recording is a first for the medium of podcasting, but it's the first time I've ever heard anything like it and I felt it was worth sharing. I'd love to see more content of this kind in the podcasting space. Imagine a travel podcast that takes you on a tour through the various cities they visit. Or a local-focused podcast that records a visit to an event in their town. I could even see a use for this approach with a sports show. Pretty much any genre of podcast could use 3D audio recordings of industry events in their niche. Check out the links to the series below. Be sure to listen with headphones. If you are aware of other podcasts that have released binaural recordings please share them in the comments. 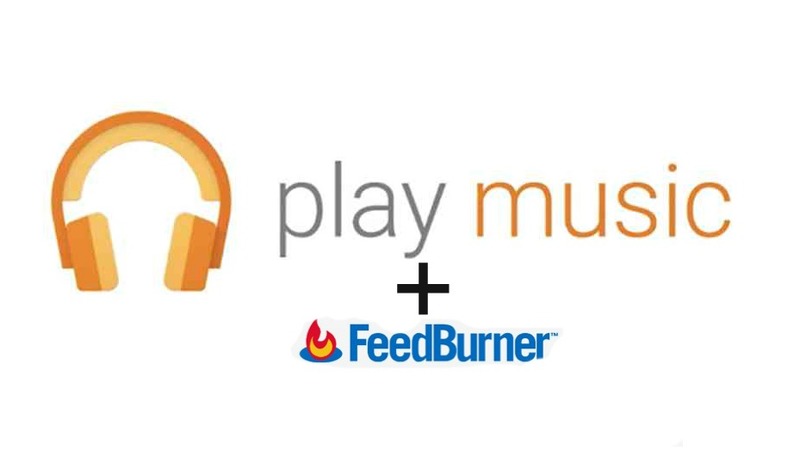 Given the fact that Google is now taking an interest in podcasting by adding them to Google Play Music does that mean that they will begin supporting podcasters in other ways also? There are a couple of Google services which could help the community even more if Google would take a little time to tweak a few things here and there. Blogger has been a popular tool for many years for folks wanting to have a personal blog to share with family and friends. There has also been some use of the service for more professional blogs, but WordPress seems to be the platform of choice for those users. 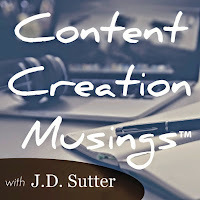 Although Blogger does have several features which are great for podcasting, (URL redirection for creating short slugs to redirect to posts, support for media enclosures in the post editor, etc.) there are more things that could be added to the tool to make it more accessible for podcasting. 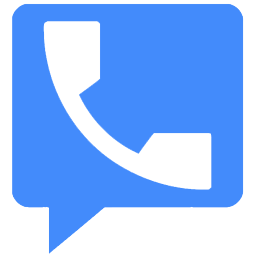 I've been a user of Google Voice since it's original incarnation as Grand Central. My GV number has been my primary one for many years. But I have also been using a separate Voice number as a feedback hotline for my podcast network for several years as well. This has been a great option for us and it would be wonderful to see Google make this tool a bit more adaptable for this use case. In particular, I'd like to see the ability to customize the website call-in widgets and the ability to upload an mp3 file as my default voicemail greeting. 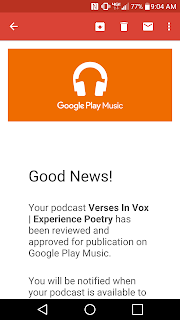 Without a doubt, the fact that Google has entered into the podcasting space is a good sign for podcasters. I'm hopeful that this move is the first in a series of moves that Google makes to show the podcasting community that they're interested in supporting them. There are many ways for them to improve their tools for podcasters and let's hope that the team working on this project is willing to engage with the community to see how we might work together. What are your thoughts on these issues? Let me know in the comments below.